Our collection of black bow ties comprises of the most classic style when it comes to suit accessories. Perfect for a range of occasions, black bow ties are available here in a number of different designs to suit your personal taste. 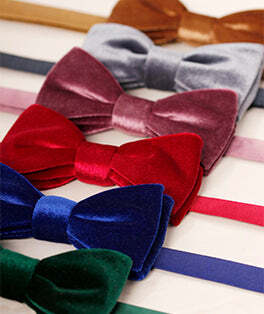 From vintage velvet bow ties to modern, patterned black bow ties, browse through our selection to find the ideal style. We offer plain designs and beautifully patterned designs such as floral, stripes and abstract prints. Shop black bow ties right here.